A survey conducted by the Wisconsin LGBT Chamber of Commerce in early November, the first of its kind, showed a majority of Wisconsinites are opposed to discrimination against transgender people. 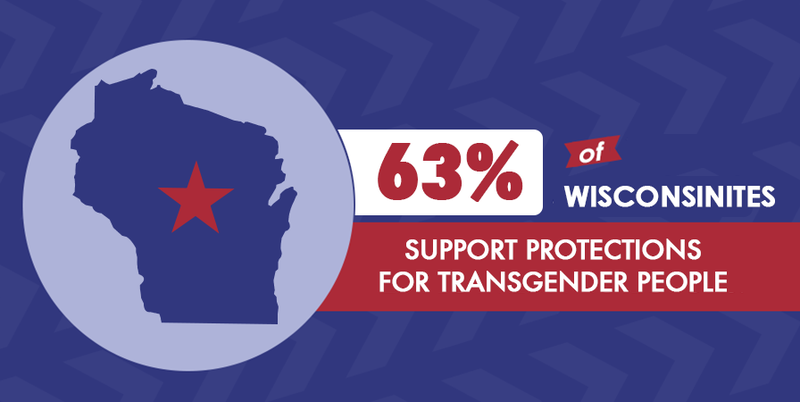 According to the results of the survey, 62% of Wisconsinites believe that discrimination against transgender people is wrong, and 63% believe Wisconsin’s existing laws should be updated to include transgender people from being discriminated against in housing, employment, and public accommodations. On the issue of LGBTQ people being refused service, the poll also shows promising results; 59% of respondents stated that a business should not be allowed to discriminate against an LGBTQ person based on so called “religious freedom” grounds, indicating that they would be less likely to patronize a business that participated in such discrimination. In 1982, Wisconsin was the first state in the nation to pass laws that protected people from discrimination on the basis of their sexual orientation. These findings have the potential to build momentum for legislation that amends the state’s existing nondiscrimination protections to be transgender inclusive. Cheers to Fair Wisconsin on all of the work they’ve been doing to Grow Public Support in Wisconsin – to keep up with the latest developments on nondiscrimination in Wisconsin, click here.